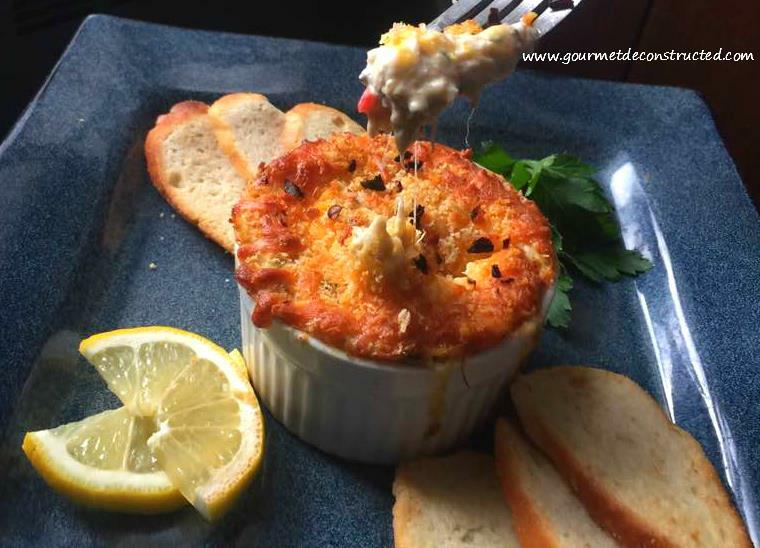 Here is a crab dip that will have your dinner guest begging for the recipe! Preheat the oven to 425°. Place the crab meat in a medium bowl and add the bell pepper, scallions, parsley, corn, and jalapeno. With a rubber spatula, gently fold in the mayonnaise, cream cheese, lemon juice, Old Bay, and hot sauce until it’s combined well. In a small bowl, combine the panko, cheddar cheese, and lemon zest. Add the crab mixture into each ramekin evenly and sprinkle the panko/cheese mixture on top. Bake for about 10-12 minutes or until the panko is toasty brown and the dip is bubbling at the edges. Serve hot with crusty French bread or breadsticks. Bon Appetit! Posted on May 6, 2017, in Seafood and tagged appetizer, comfort food, corn, crab dip, crab meat, food, jalapeno, lump crab, old bay, panko, party food, seafood, spicy seafood. Bookmark the permalink. Leave a comment.